Cutting Dragon Wing Hidden Blade Necklace | BUDK.com - Knives & Swords At The Lowest Prices! Let this dragon do the talking for you! 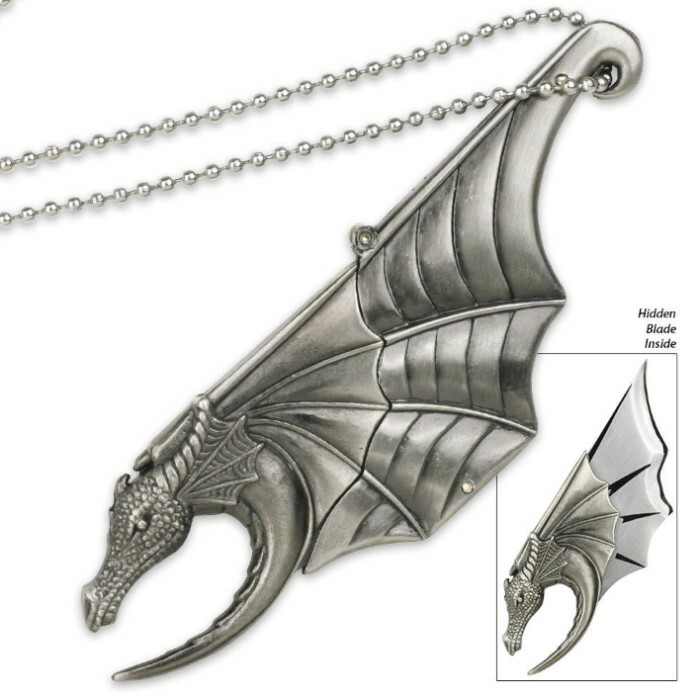 This cast metal dragon necklace features a hidden 1 1/2" curved blade. Simply remove the dragon's head from the wing to reveal your own personal defense blade. Includes a 30" beaded chain. Its a cool display piece. Would not recommend for real self defense, not very sharp and almost impractical. Makes a good piece added to my collection though! Thanks BudK! Beautiful piece! I absolutely love the details, and the shape of the blade, even though it is pretty dull, though the tip is sharp. It is rather difficult to take the blade out, you kinda have to wiggle it sideways then pull it out, so it'll do you no good if you want to draw it quickly! It is very heavy, so I don't recommend wearing it around too much. My blade did have a small stain on it, but it's no big deal, and I'm sure it's not on all of them. They can't all be perfect! Amazing! The blade is a bit dull, but that was easily fixed. I don't reccomend wearing this outside, it's much bigger than pictured, and not very concealable. Other than that, a beautiful weapon! This thing is BIGGER than you think it is. The only issue I have is that, while the picture shows it forms into itself perfectly, I'm looking at it and there's just a little hint of the blade showing. You wont be fooling anyone wearing this: its just that big. When I received it from FedEx I was amazed to see that it was a nice sized blade, i didnt see nothing wrong with it once I opened it. Nothing was loose, cracked or bent. It was in good condition. My first purchase from True Swords and it will not be my last. I find this potentially one of the best tactical defensive pieces of jewelry I have found. I am not sying it has no little quirks but over all the blade fits and draws smoothly, is enough to do the job, and conceals well enough it would take abit of looking to notice.